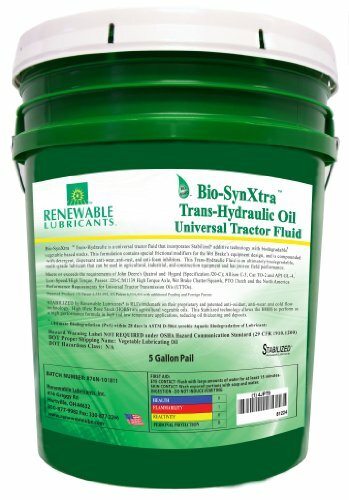 Renewable Lubricants Bio-SynXtra trans-hydraulic is a universal tractor fluid (UTF) that incorporates stabilized additive technology with biodegradable1 biobased and synthetic based stocks for improved performance over conventional tractor oils. This multigrade formulation contains special frictional modifiers for the Wet Brake's equipment design, and compounded with detergent, dispersant, anti-wear, anti-rust, and anti-foam inhibitors. Bio-SynXtra trans-hydraulic fluid is a multipurpose all-weather super tractor hydraulic fluid that can be used in agricultural, industrial, and construction equipment and has proven field performance. Improved cold weather performance; excellent oxidation stability; enhanced efficiency in synchronised and glide shift transmissions; interchangeable with standard UTTO's; improved performance over conventional UTTO's.